In the infant years of my blog I got acquainted with Stampington Company and their mesmerizing magazines! My heart tied fast and strong around Artful Blogging Magazine. A magazine that satisfies my cravings for visually enchanting and mesmerizing photos accompanied with heartfelt, warm and inspiring stories. 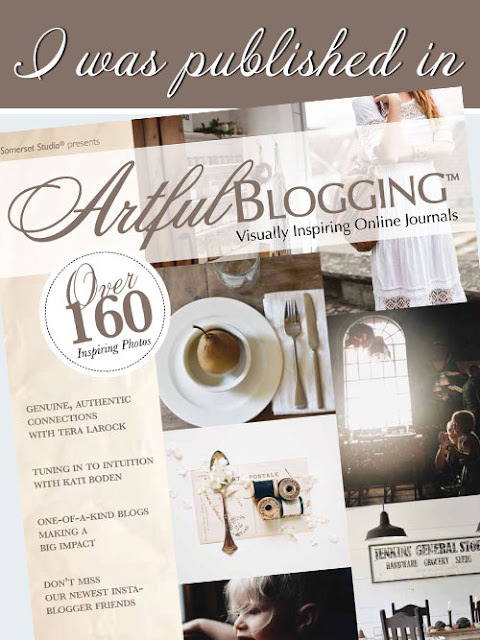 I think every artful bloggers' dream is to be featured in this magazine. This year my dream came true and I cannot possibly describe the excitement, fulfillment and pure joy that I am constantly wrapped up in ever since I was first contacted about this several months ago, until I finally had a copy in my hands! I made another full circle. My article called "Capturing Memories" appears in their Summer 2018 edition and tells the story of using my blog as an online journal to capture beautiful creative moments of time spent in artful bliss. I just got the copy a few days ago and yearning to prolong this feeling of excitement I have been slowly going through it, soaking up story by story, picture after picture, one at a time. They had a small surprise for me I was unaware of. They chose my banner to be featured in the "Banners We Love" section and it really felt like a cherry on the top of a cake, when I discovered it! I must say a huge and warm "Thank You!" to my editor Danielle Williams who worked with me, wonderfully guiding me through the process sharing valuable advice. My deep bow to you dear lady! You can order the magazine online or buy your copy at your nearest newsagent. That is amazing Maya, Congratulations. I have been meaning to write to Stampington for a few seasons now asking if they would be interested in considering my work for publication but I never seem to make their deadlines. Seeing you being featured motivates me to try harder to get my work published in the coming seasons. Congratulations, dear Maya! This is awesome! I've never seen this magazine, but judging from your pictures it's great. And your work is worth being published in a magazine! Thank you Divya. You should do that! I caught their eye quite spontanously and I was overwhelmed to be offered a feature! Thank you dear Marjan!It really made feel over the moon just because I know how valuable it is to be published in AB as a blogger and this feels like getting an Oscar! Congratulations, Maya! I wasn't aware of this magazine until I saw your post and I must say it looks very stylish. You must be on cloud nine after seeing your work featured and I'm very happy for you! Indeed Alhana! I feel overwhelmed and it is a dream come true! They made it look marvelous and I can't be more satisfied! Hello Maya, Congrats on being featured in this magazine. It was such a pleasant surprise to see and read this article. You deserve it for all of your hard work and creations you make. Congratulations Maya! Your hard work and talent have been acknowledged and of course we already knew you are a star!! Thank you so much Mary! That is so sweet of you! CONGRATULATIONS, Maya!!!!!!! You certainly deserve it!!!!!!!!! Hugs, my friend. Congratulations!! Very much deserved! Just before I read this post, I was thinking to myself how special your blog is and how glad I was to find it. I look forward to enjoying your creativity often! Thank you, thank you so much Pam!I am much obliged! Happy you wrote to me too so now I can enjoy your mindblowing talent! We are in Zlatibor - Serbia!